I don't mind layovers between connecting flights much. If they're long enough I can have a little visit of the connecting city. Short of that, I find spending time in an airport more comfortable than time spent on the plane. And I can do work if I'm stuck in an airport. I also like to try to fly the shortest route for environmental reasons, instead of adding extra legs. So I'm less concerned about total travel time and more interested in how much time will be spent in the plane. Is there a flight search that will allow me to filter or sort results based on the total scheduled flight time instead of the scheduled flight time plus layovers? 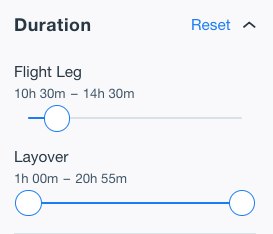 The best way that I can think of to find flights with less time in the air is to perform your search with Kayak and then drag the Flight Leg Duration slider down. It's based on what the available flights are so if you only give yourself a small range above the minimum then you can get a group of very short flights. There will definitely be some work left for you to do and they won't be sorted but I think it could help. On a slightly related note, I like to use the site AirWander to find flights with long layovers in cities so that I can go out and explore. Is there a website in which you can find flight tickets by filtering to certain durations of flights? Mixed flight / bus search engine?